Being a pedant, bananas (musa) get me worked up sometimes. 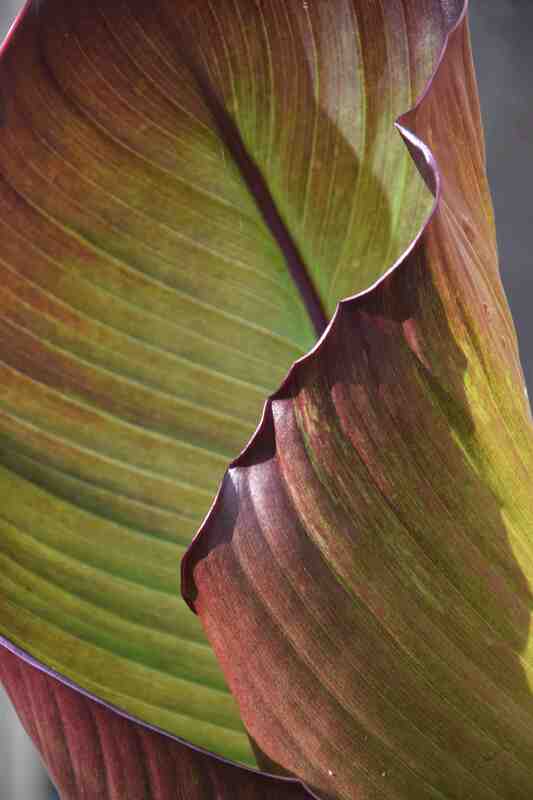 I get annoyed when people mention banana ‘trees’ since they are herbaceous perennials and not trees at all and the first ‘banana’ I ever grew from seed was not a banana but ensete, commonly called the Abyssinian banana. This is certainly ‘banana-like’ but differs because while bananas have upright ‘stems’ (actually made of the leaf stalks) that eventually produce a central flower stem and then die, producing several ‘suckers’ to perpetuate the plant, ensete is monocarpic and when the plant flowers and fruits it dies. So this plant is usually grown from seed and is relatively easy, if a bit slow to germinate. With care, a spring-sown seed can produce a plant with 2m long leaves in a season. 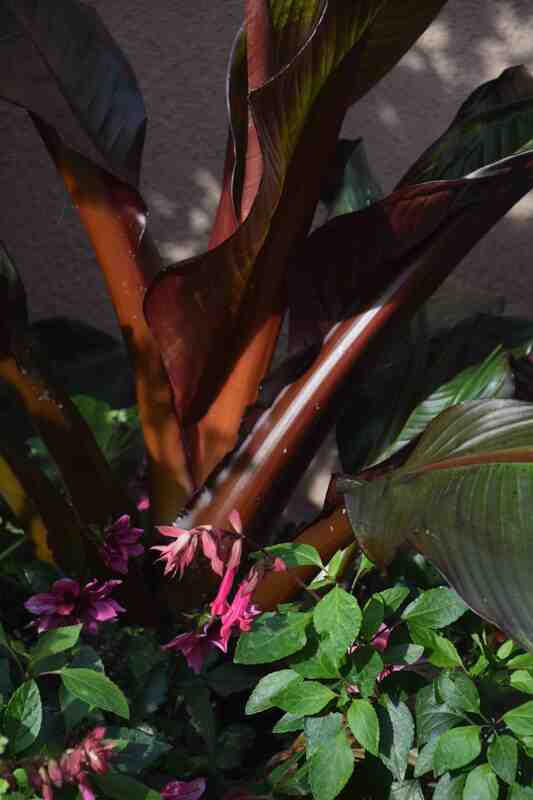 Good though the species (Ensete ventricosum) is, the most beautiful is the variety ‘Maurelii’ which is suffused with burgundy. Now easily increased by micropropagation this is commonly seen and affordable. I bought two for pots this spring and they are growing well. 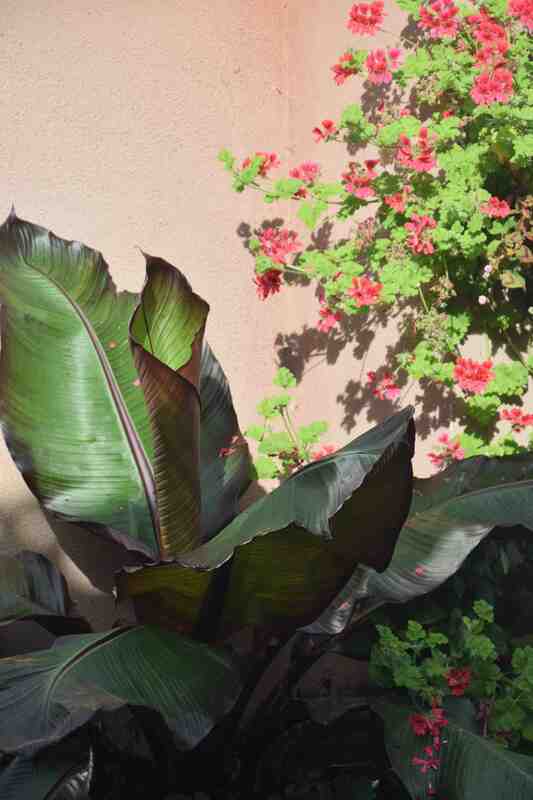 Few plants give such a look of the exotic to the summer garden and the combination of beautiful colour and dramatic structure make this worth a bit of extra effort. The secret to growing this, and the related bananas, is to give them lots of water and feed and put them in a sunny and sheltered spot. Wind will tear the leaves to shreds. Although my plants have grown to five times their original dimensions they are still babies and they will easily reach 3m high and across in another year or two. We have been lucky with the weather but they really are on borrowed time and I need to get them under cover soon. I need the pots for spring bedding and bulbs so I will dig them out, chopping off much of the roots and all but a couple of leaves, where the leaf blade meets the petiole so I have a sturdy ‘trunk’ and they will be potted in smaller pots and kept in the greenhouse where I can keep them at a minimum of 5c. Kept almost dry they will keep ticking over until spring when I will put them in bigger pots again and up the watering and then feeding. Although some bananas (particularly Musa basjoo) may be hardy in some areas, with some planning and winter care, because they have that underground rhizome which allows them to send up shoots from below the frost level, ensete will not tolerate this kind of behaviour and must be kept frost free. Generally there are few pest problems with this plant though, in a greenhouse, mealy bugs can get into the centre and distort the leaves, and red spider mite can attack the foliage. This summer black aphids found both plants their favourite new food and the underside of the leaves were thick with the pests. Luckily a spray with an organic insecticide sorted them out. This looks such a wonderful plant, your pictures are amazing as usual. Interesting, but not for my garden I’m afraid, with all the wind I get! I recognise Salvia ‘Wendy’ though in the last lovely photo.